Audio is essential in bringing an immersive experience to life. The new Vive Deluxe Audio Strap is designed with adjustable earphones, allowing you to enjoy the 360-degree realistic sound in even more comfort and convenience. A clever way to adjust the strap gives you the perfect fit. Enjoy your VR in ultimate comfort. The Vive Deluxe Audio Strap features interior padding for extra contentment. An adjustment dial allows for just the right fit. You can place the cable path at a side position to enjoy an even more immersive experience. The Vive Deluxe Audio Strap provides integrated earphones with great sound quality so you will have a more convenient VR experience. The earphones offer height and angle adjustments to best fit your ears and are easy to put on and take off as well. Features • 360-degree audio experience. • High adjustability for comfort. • Convient & easy to attach. • Compatible with HTC Vive VR Headset. Please note: HTC Vive VR Headset not included, sold separately. HTC Deluxe Audio Head Strap with Built-In Over Ear Headphones for HTC Vive Virtual Reality Headset is rated 4.9 out of 5 by 8. Rated 4 out of 5 by stat from Essential Should be standard - headset is complete crap without it. Bit expensive for what it is considering the headphones ain't high spec or anything. Rated 5 out of 5 by lizzylou82 from This project has great features This has made using the Vive so much better. It takes the weight away from the front so the headset is not sitting on the bridge of your nose. Rated 5 out of 5 by JonnyM from If you have a Vive you 100% should have this. In summary, a must have upgrade for the Vive. 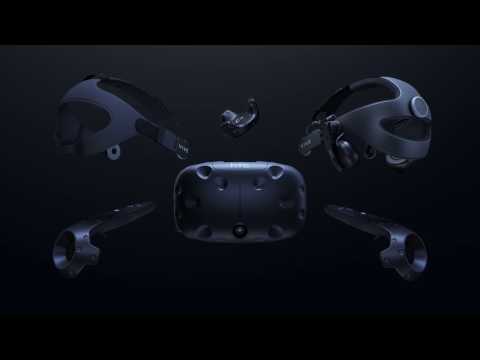 HTC should really include this as standard as part of the Vive kit, and yes I begrudge spending an extra hundred pounds on it... But its transformed my Vive. The original strap you get feels very tight on your head, slips a lot and is uncomfortable for longer sessions. This DAS makes the headset easier to put on and take off, is vastly more comfortable and fits so much better, and you have built in headphones which is far more convenient. On the subject of the headphones themselves... I used to use my Bose QC35, these are obviously not up to that sound quality, but they are good and are both more comfortable when combined with the headset and easier to use. Basically, if you have a Vive and don't have the deluxe audio strap, buy it, you won't regret it! Rated 5 out of 5 by ValJ from Much easier It's a lot of money granted but to not have to mess about with headphone cables and slipping off when you bend down or jump up makes it worth the money. Sound quality is good too and it is easily adjustable between players although when someone knocks on the door you can't just lift it up without removing your eyebrows apparently. Overall a very good product, don't think about the money just buy it. Rated 5 out of 5 by SamN from A must have for Vive owners Makes wearing the headset a lot more comfortable than the original headstrap. The headphones are of good quality and being able to move them around easily is also a plus. The strap takes most of the weight off the front of the face and spreads it evenly across the top of the head, making the headset feel a lot lighter which increases immersion. A must have for Vive owners. Rated 5 out of 5 by AndyBell73 from Vive Alive Absolutely amazed at how much more comfortable this head-strap is compared to the original. Fitting to my Vive was a breeze. Did checkout a couple of YouTube clips just to make sure i was doing it correct and all went extremely smoothly. My Headset now fits extremely snug against my face and once the sweet-spot is obtained there is no need to keep adjusting. Was always readjusting with the old strap as it never fit snug enough not to keep moving. Just place the head-strap over your head and tighten, its that simple. The attached headphones also sound great. Was a little sceptical due to the size of the headphones but they have surpassed all expectations and produce some great low frequency as well as mid and high. I have given this product a 5 star rating for value, i have seen other reviews marking the value down as its quite expensive for a head-strap, but, I personally feel this is justified once you've tried it. This is a must have addition to your Vive and i guarantee you will not be disappointed. Rated 5 out of 5 by Jen22 from Love it! Bought this last week and don't regret it it's a massive improvement over the stock strap and the ear phones that comes with it are really good. The quality there for sure and feels really comfortable. The only thing that's stopping it from getting full marks is the price. Rated 5 out of 5 by RavenEyE from Slob Times well if you need to have an excuse to buy this product.... look no further than here. In my opinion this divice save loads of time by cutting out the hassle of the extra cords for your head phones plus no pain on the bridge of your nose after 30 min of play time... costs a bit but well worth it.